Note: Currently we are working through the book of Luke at the Ebenezer congregation. I have decided to start posting thoughts from our messages here (in English) in the hopes others may find them edifying. The crowd parts – actually, it’s more like the crowd recoils in horror, for making his way, stumbling, between them is a man covered from head to foot with the scaly, rotten, pus-laden signs of leprosy – a disease that carries with it not just the terrors of it’s disgusting, and often fatal physical symptoms, but also a heavy cultural spiritual significance. It is seen as (and indeed often has been, in truth) judgment from God, and carries with it the condemnation of expulsion from the public worship in the Temple and separation from the community at large. The people’s revulsion is more than reasonable. There is one notable exception to this reaction, however. Jesus stands there in front of the now prostrate man, his face a picture of compassion. “Lord, if you want to, you can heal me!” the leper gasps. 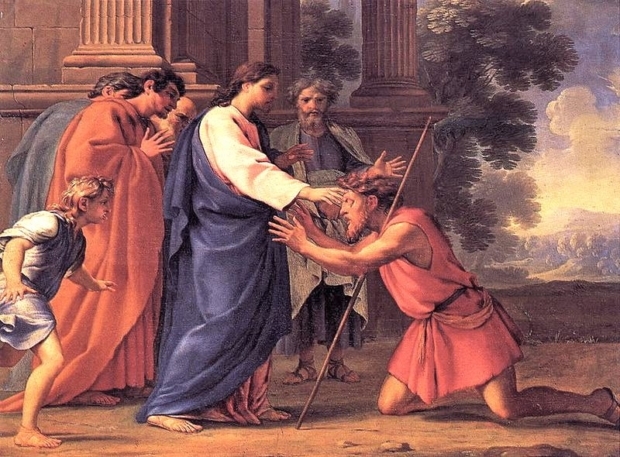 The crowd looks from the leper to Jesus, to the leper, and back to Jesus again. “I want to.” Jesus says simply. Understanding the background of leprosy in Bible times is essential to having a complete notion of what is happening in this biblical narrative. Otherwise, it is just another story of another persona Jesus healed. In Old Testament times, leprosy did at least three things to a person: 1) It separated him from temple worship, 2) It separated him from his community, and 3) It usually killed him. Separation from God, removal from community, and death. It’s no wonder that in Psalm 51:7 David uses the language of leprosy in alluding to his sin with Bathsheba. Put in these terms, Jesus’ act of touching the leper is absolutely amazing. Let’s talk about “touch” for a minute. Touching requires intimacy. It is an invasion personal space, either for aggressive or loving purposes. There is little middle ground. Here in Brazil, it is common in our churches to have a few minutes during the service to greet one another. I regularly see this practice mocked on American social media, but I doubt our people would be pleased if I were to propose canceling it at Ebenezer. It is a very special time, as friends and brethren greet one another…and there is always touching. At the very least one can expect a warm handshake, but usually a big hug and a pat on the shoulder is in order. Why? Because we are part of the same group, the same community, we identify with one another. Now back to Jesus. He did not need to touch the man to heal him. He healed people without being physically present. But he did touch that man, right there in front of all those people. And in doing that, Jesus identified with him, in all his sickness, revulsion, pain, and sin. And that healing touch had three results in the life of that leper: 1) he was restored to the worship of the Temple, 2) He was restored to his community, and 3) he was given life. In this passage, Luke, the physician/historian/theologian has given us an amazing picture of the incarnation and the saving work of Christ. Christ identified with us, and those who come to him for healing are restored to fellowship with God, are inserted into the community of believers (the Church), and are given eternal life. What about you? Has Jesus touched your leprous soul? Touching was not the only thing Jesus did in this passage. Next week we will look at two other actions he took, which speak to his ministry to us.